Smalti/stained glass mosaic 18" x 24"
This is one of my first mosaic projects, and the very first time I tried using Smalti. 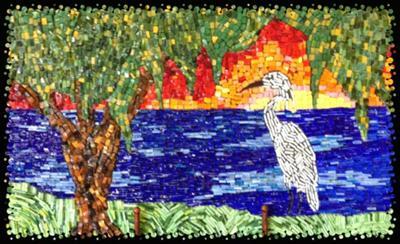 The stained glass used for the water and the grass is scraps from a stained glass studio. Rather than laying the stained glass flat however, I cut the scraps into pieces about 1" x 1/8th", and set it into thin set with the riven side up. I love how this gives the effect of texture and movement.